“The Karuna group is probably the most active Sri Lankan paramilitary in abductions and extrajudicial killings. On March 20, former Tamil MP and legal expert Dr. K. Vigneswaran (strictly protect) confided to PolOff that even MPs fear that the GSL will use Karuna to assassinate them. Colombo-area Tamil MP and Chairman of the Civil Monitoring Commission Mano Ganesan echoed this anxiety to us on March 29. A number of other MPs, Muslims as well as Tamils, have told us privately that they fear for their lives. Vigneswaran stated that he believed Karuna set up the assassination of Tamil MP Joseph Pararajasingham on Christmas Day 2005 (ref G) with the help of EPDP leader Devananda. 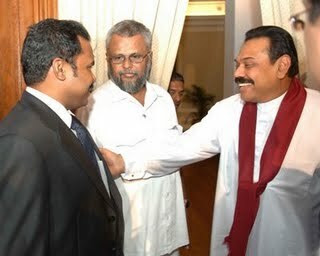 Vigneswaran was also positive that Karuna cadres were employed in the killing in Colombo of popular Tamil MP Nadarajah Raviraj on November 10, 2006 (ref F).” the US Embassy Colombo informed Washington. The Colombo Telegraph found the related leaked cable from the WikiLeaks database. The cable is classified as “SECRET” and discuses Sri Lanka’s paramilitary operations. The cable was written by the Ambassador Robert O. Blake on May 18, 2007. Lankan paramilitary in abductions and extrajudicial killings. On March 20, former Tamil MP and legal expert Dr. K.
MPs fear that the GSL will use Karuna to assassinate them. told us privately that they fear for their lives. Day 2005 (ref G) with the help of EPDP leader Devananda. Nadarajah Raviraj on November 10, 2006 (ref F). which he believes are the responsibility of the Karuna group. the back, indicating that the man's "time had run out." Karuna the killer at the time of the murders of Ravi Raj and also Traki used to travel in the east with 200 Special Forces (SF) personnel (Gota’s Angles). These Special Forces killers would dress in black and wear masks and carry machine guns… Clearly Karuna the killer needed a lot of protection to carry out his violence, just as today Rajapassa needs six back up cars and 400 armed forces personnel to feel secure. Like Macbeth these murderers, Rakpassa, Devananda and Karuna fear the people they claim to represent! What a shame that individuals like Ravi Raj and Taraki have been killed. Let them be Tamils, they were so affable individuals and above board and were honourable men. I cannot believe some one to decide, to have killed them. The killers cannot be rational people but sick in their minds. Otherwise how can they live after committing such gruesome murders. I only hope there will be a day they will be brought to book and punished. That is what I am also wondering about killings of Hon. Kadirgamam, Dr. Nalin thiruchelvam, MP Amrithalingam, MP Maheswarn and all. How pity are such killing also? Hope your brain should tigger the same way of these killings. Otherwise you may need some help from a mental doctor. You get it? John MCcain has started to tie the robe where Blake left. Basil says getting out of the North Development project. Military watches and hear the thundering of the TNA’s (LTTE) slogans. UNHRC and the world wants the LLRC implemented. We saw some policemen arrested for the killing of Students and we see some other loyal servant’s names are frequently discussed in private and public. Why !!? Blake left with exposing all secrets …. Blake also left SL exposing TNA’s private parts. TNA is no different to blood sucking LTTE. TNA is the cat paw of LTTE. Colombo Telegraph helps the world from Obama and Putin to see MR in his real form and the company he keeps.. Also the Queen and Cameron to hang their heads in shame at the calibre of the man who is to host the CW. If they are earnest and honest, all it takes is a stroke of the pen to CANCEL THE CW CONFERENCE in SL. Will the CW countries fly off the planet or the planet itself off its orbit? Is there any Srilankan Minister who is not a murderer? Yes – Podian Praba- the son goat or your beloved leader. The king is the Peelam Kingdom. One day every one of them have to leave this world with out any security with them. I wish if these people know about the spirit world before they go there. I pity those who had the intelligent but not use in the correct way. In the spiritual world nothing is hidden and one had to reap what he has sown. Are you EVER going to replace the “c” that is missing from your last name? Your identity is totally incomplete with that omission. Vigneswaran stated that he believed Karuna set up the assassination of Tamil MP Joseph Pararajasingham on Christmas Day 2005 (ref G) with the help of EPDP leader Devananda. Tamil nazi always belive it was somehow “the other side” killing people. Its indeed a strange phenominon. That opens plenty of opportunities. But Tamils don’t have self respect. So even when they believe the government and Sinhalese are doing bad things to them, they still colonize Sinhala areas in Colombo, etc. and live in SL. Who will accompany these murderers the ministers to hell? Amongst others, they will be accompanied by Kudu Duminda, Mervyn Silva, not forgetting Namal and Malaka Rajapassa!! Surely podian Praba the son goat – the king of the Peelum Kingdom. He has a lot of merit to be in the same list. Thank God, these two leaks have become available at the nick of time before the NPC polls. If Tamils do not rout the EPDP gangsters at this election, they will only be asking for more and more abductions, murders,rapes and creation of child prostitutes. Let us hope that Tamils will wake up to the dire situation! It has been the gravest of all faults of the Tamils to fore go God sent opportunities for redemption, and then lament interminably that they have not been redeemed. Put bluntly, Wikileaks and Colombo Telegraph have placed incontrovertible proof about the curse and the scourge afflicting the Tamils. It is most timely. They are urging and coaxing the Tamils, if you have a vote prepare to cast it on the 21st. Let not a traitor be elected. It is now for the youth and the social media to take across the images and the message and to galvanize all Tamils. How did CT find it in the ‘nick of time’….? Very interesting…. But still millions of Tamils living in SL? Where is their self respect? I don’t think they have any. If the SL government treat Muslims this way, I will take the first place or boat out of SL because we have self respect but you don’t. Fatima it is you who does not have self respect. Hiding behind a Muslim name hoping to create disharmony among Tamils, Muslims and Sinhalese. Our country is cursed by sick mind like yours. Douglas and Karuna have earned their place for scraps at the table and your sick masters have accepted them. .
No we have self respect and you sick don’t. Look how many of you live in Colombo (Chingalam homelands) without any shame? Even after 1958, 1977, 1983 and 2009!! Damn shame! Like a puppy which still follows you after a few kicks and rejection!! Look how many Tamils in government payroll? You may not know the government service is highly politicized. Only Rajafucksa booty lickers are allowed and there are hundreds of thousands of Tamils!! Where is self respect? Where is the self respect of Tamils who surrendered with white flags? Where is the self respect of Tamils who rejected provincial councils as a gimmick then and now eat Rajafucksas’s humble pie and toe the line? Tamils protest at cricket matches but see how a Tamil is the CAPTAIN!! Where is your self respect? Other people KNOW how to treat people without any self respect. LTTE was ruthlessly annihilated by The SL rulers. They now are controlling the entire country ruthlessly. All Sri Lankans are suffering except the King and his relatives and their stooges. But one thing is sure SL is a better place than when Podian Preba was running a muck in NE SL. Surely there is no difference between the Tigers & the Rajapakse so called Government– both are a bunch of terrorists. What I would like to know is what will be done to DD and Karuna if a new party succeeds in coming to power. There should be a clearly articulated plan of what is to be done. Removing these two from society must be the number one priority of any in coming GOV. Making sure they do not escape by monitoring all ports of departure. Immediate proscribing their political parties should follow. Action people we need action. Useless crying about what they have done. A list of all the crooked judges who do the bidding of the mahasona must also be maintained followed by immediate sacking and replacement. Retired judges with a good reputation can be brought in temporarily.